A little known fire brigade works in a well-known location: a courtyard in Donghuamen at Beijing’s world-famous Forbidden City. This magnificent example of ancient architecture, also called the Imperial Palace, is located in the very heart of China’s capital. Officially established on May 25, 1975, the fire brigade is under the command of the Beijing Municipal Fire Bureau. Currently, there are around 45 firefighters on the team. The wooden structures and contents that make up the Forbidden City pose a huge fire risk that requires great vigilance. To protect the surrounding environment of the Forbidden City, the fire brigade also helps clean the roofs of the ancient palace buildings every season, a task that includes weeding, de-icing and humidifying. In addition to preventing and putting out fires, the firefighters also help prevent terrorism, deal with various emergencies and carry out rescue tasks in the 3.74-square-km area containing the Imperial Palace. 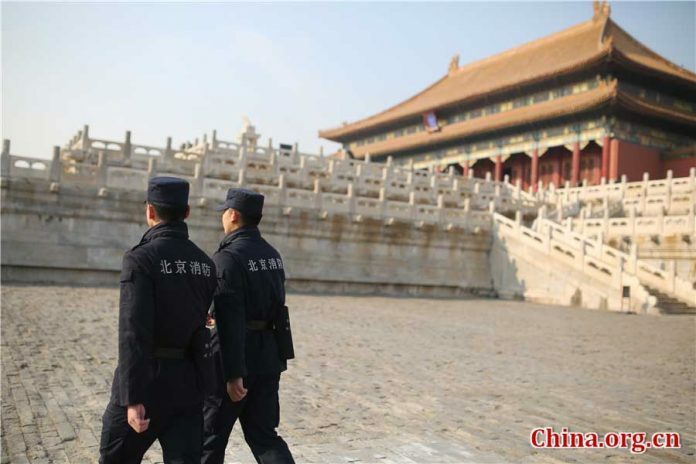 There are actually another 64 key scenic spots and major political and cultural institutions concentrated in the area under the fire brigade’s jurisdiction, including the Tian’anmen Gate Tower, the Great Hall of the People and the National Museum of China flanking Tian’anmen Square. Since its inception, this special team has successfully completed more than 30,000 major fire and security tasks. The capital city has attracted increasing numbers of domestic and foreign tourists in recent years, with the number in the Tian’anmen area alone reaching nearly 100 million visitors annually. In addition, more than 100 important activities are held every year in the area, creating an arduous workload for the fire brigade. Cai Rui, a leading brigade officer, claimed his men can reach the site of any emergency almost as soon as it occurs. “All my teammates are elite people,” he insists. Unexpected things happen almost every day. In 2016 alone, the firemen helped more than 30 children who got separated from their families.